As a child, I grew up eating chillies like no body’s business. Chilli padi, green chilli, sambal chilli, sambal belachan; I’ve eaten them all. I guess you could say I was weaned on chilli. Not that it’s a bad thing. At least my stomach is stronger than most people, and unlike my mum, I don’t get a tummy ache after having some fiery curry. Spicy foods, I love and even more so, Indian, Malay, and Peranakan food. I used to drink Dad’s curry like soup, lapping it all up and man do i enjoy the adrenaline rush when you’re tongue burns! Okay, before I start sounding like a sadist, I’ll just continue professing my love for Indian food somemore. I enjoy eating naans, chapatis, pratas, kerala curry, rasam, aloo palak, kulfi and the list goes on. My indian friends sometimes think that i’m more indian than them! Hey, I can cook tandoori chicken well… Picked it up when I was working at this Indian restaurant as a waitress last year. Mind you, I had to wear a punjabi suit! Not that I mind – I liked it in fact. Besides, I think it’s the Indian blood in me working up. Haha, i’m not half-indian or anything, but my paternal great-grand father was Indian. And my dad looked so much like an indian construction worker when he was younger (old photos), what with his mustache and all! shh.. don’t tell him I said that. it doesn’t help that my dad’s also quite dark. 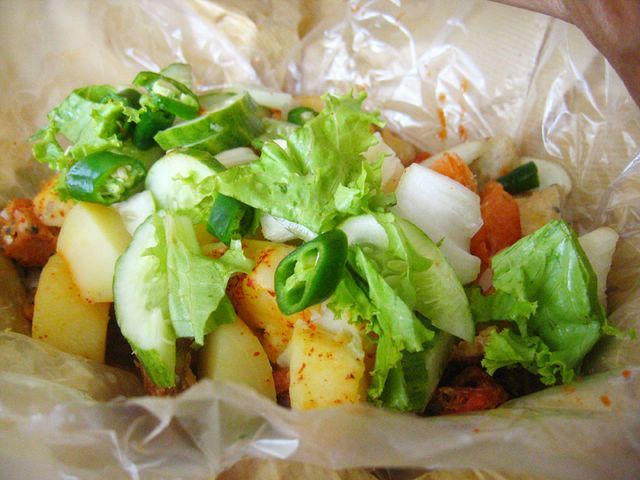 It’s usually a mix of ingredients like tau kua (fried soya bean curd), fish cake, tempeh (fermented soybeans), cucumbers, green chillies, eggs, potatoes, prawn encased in dough etc. There’s also a lot of other ‘dough-y’ stuff which I don’t know the names of. 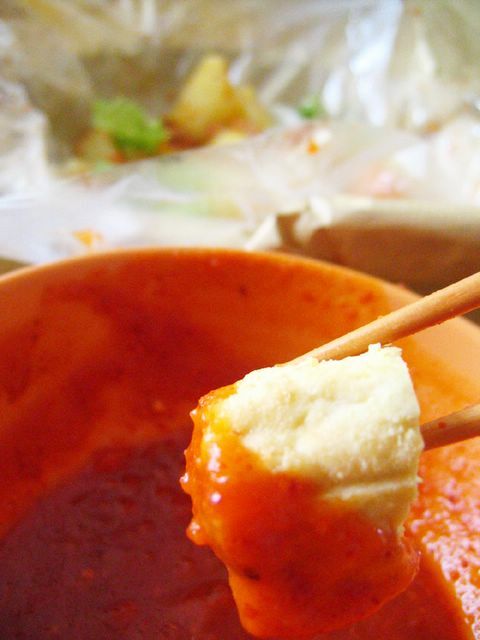 But ultimately, the main highlight of the rojak is the sauce which you dip the ingredients with. I’m not sure what it’s made of, but it’s usually bright reddish-orange, a little sweet and spicy and some contain peanuts. 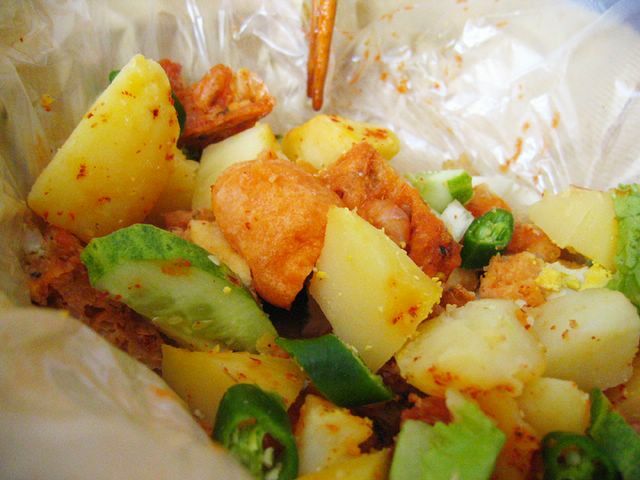 This rojak which you see above was bought at Geylang and it’s quite well known. Well someone told my mum it was nice so my dad went to buy it the next day. It was pretty yummy… and the chillies were seriously FIERY. My mouth was literally on fire. I was the smartypants who just put all the chillies in my mouth. Thank God I had some milk to douse the ‘flames’. Hehe.. but I still love chillies, always have and always will! That reminds me of this ultimate ‘Insanity Sauce’ I tried a few years back. It was by far the HOTTEST sauce that I’ve ever tried. If you think jalapenos or tabasco sauce was bad, man you’re in for a shock. This sauce makes you cry, it makes you go down on your knees, wishing you hadn’t made the ‘mistake’ of letting it make contact with your tongue. It’s seriously insane to eat it, but then again, whatever doesn’t kill you makes you stronger doesn’t it? I haven’t been able to find it in Singapore, but if you really want to test the limits of how hot can you go, try the infamous ULTIMATE INSANITY SAUCE. I think you can get them online. Try it if you dare!!! I cant handle fiery stuff at all. I read an article that said that people who cant eat spicy foods, actually have more tastes buds than those who can handle lots of fire. Hmmmm, wonder if that’s true? i love spicy stuff, but i stomach’s lousy. eat first then suffer the consequences. there’s this jap noodle place near capital square. you can choose the noodle soup to have 1, 2, 4, 6 or 8 chillies kinda thing. I can only try 1 or 2. Those who dare can try the max. Have you tried that? what’s the name of the noodle place? I don’t think i’ve tried it before… is it really spicy? ahh i feel like trying it! It’s Beppu Menkan @ Far East Square. Here’s a review: http://food.asia1.com.sg/gdfd/res_20050206_001.shtml There’s another branch @ Tiong Bahru Plaza. Sadly my taste buds and throat can’t take over spicy stuff so I only tried the cold noodles there twice once @ Far East Sq and another @ Tiong Bahru.